As we approach the September 2 unveiling date for Huawei's next phablet, we're starting to see more and more leaks and rumors about it. This device will clearly have "S" in its name, as per Huawei's teasers, but it's still up for debate whether it will be called Mate 7S or just Mate S.
Regardless of all that, the new Mate has seemingly been put through the paces of the AnTuTu benchmark recently. This has thankfully revealed a pretty complete list of its specs, through the benchmark's information screen (which you can see in the image to the left). So, the next Huawei Mate is apparently going to come with a 5.7-inch 1080p touchscreen, a 20 MP rear camera, an 8 MP front-facing snapper, 3GB of RAM, and 32GB of built-in storage. At the helm we see Huawei's own HiSilicon Kirin 935 chipset, featuring an octa-core CPU clocked at up to 2.1 GHz and the Mali-T628MP4 GPU. At the time it was tested, the smartphone ran Android 5.0 Lollipop. These specs mostly fit with what we've been hearing so far, but there are a few surprises. 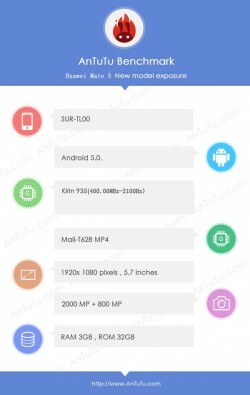 The main camera has been rumored to be a 13 MP unit some times, and the display resolution most talked about was QHD. As for how the phone actually did in the AnTuTu benchmark, the overall score it achieved was 46,776, which isn't bad but isn't record-breaking either. However, in the GPU compartment things aren't looking good at all, with the 3D performance score being just 11,946. Hauwei phone are top class what its has to offer they are a multi billion pound tech giant. there CPU outperform pretty much all like for like processors, what you have to remember that most phone components are manufactured in the east. Man these Chinese phones are so underwhelming and boring, not to mention they use crappy in-house cpus instead of more reputable ones like Snapdragon or Exynos. what is so rubbish on it ?